OLALA FD01 is designed for people who need to protect your confidential documents with higher security. * The pen drive can be divided into public and secure areas, and you can divide their storage space by your demand. * Lasting light: the encrypted partition is unlocked in the display state which can read and write. * Off: encrypted partition locked in a hidden state is not accessible. * Twice blinks: the error of fingerprint recognition. * 30-day money-back guarantee for any reason. * 1 year warranty for any quality-related issues, you can be confident in the outstanding quality, performance and reliability of every OLALA product. * The encrypted partition will be activated by registering a password and adding at least one fingerprint. * Management software is ONLY available under the Windows 7/8/10 system. * The anti-virus software may prevent management software from opreating. * Dry your finger and clean the fingerprint identification area before inputting fingerprint. [Advanced Security Tech] Fingerprint encryption codes and decodes by using your unique fingerprint to prevent unauthorized users spitefully access to your precious data. No longer to worry about forgetting password. [Dual Free Disk Partition] There are two areas in the drive stick: security and public partitions, and you can divide their storage space by your demand, from 1%-99%. Security partition needs to be identified by fingerprint or password to access to read and write. Public area is as same as the ordinary pen drive. [Fingerprint Management Software] Management software provides fingerprint management, partition adjustment, password changes, user empty, language settings and other functions. With its own fingerprint management software (in CD-ROM partion), fingerprints can be added or deleted, and supporting up to 8 fingerprints. [High-speed Transfer and Identification] Faster fingerprint recognition and 360 degree fingerprint recognition, it only takes less than 1 second to get a matched recognition. USB3.0 connector, saving time when you transfer or save digital files, videos, photos and music. [Fashionable and Humanization Design] The push-and-pull retractable slider not only makes the thumb drive looks simple but also protect the USB connector. The indicator is used for displaying the status of the encrypted partition and the status of the fingerprint recognition. 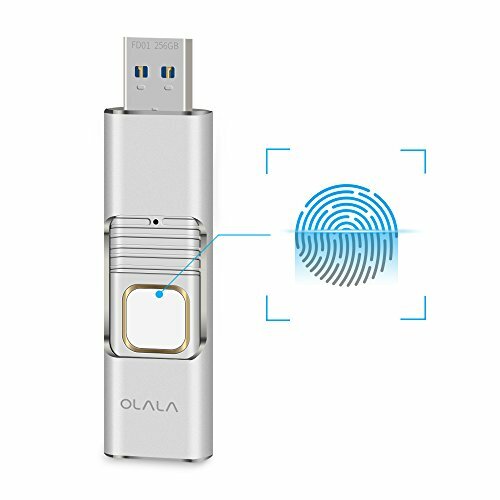 If you have any questions about this product by OLALA, contact us by completing and submitting the form below. If you are looking for a specif part number, please include it with your message.